Keiji Inafune's Comcept surrenders Soul Sacrifice to Japanese gamers on March 7, 2013. 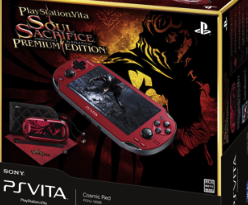 The dark fantasy action-RPG also gets a Premium handheld bundle in Japan, featuring a snappy 'Cosmic Red' Vita. Also included are matching earphones, a 4GB memory card, and a title-sporting pouch, strap, and cloth. The bundle's priced at ¥29,980 ($365). Inafune originally hoped to release Soul Sacrifice this year, but at September's Tokyo Games Show the Mega Man creator ceded that plan. Inafune said Comcept wanted to tweak the game based on feedback gathered from the exhibition.Soul Sacrifice is confirmed as coming to North America and Europe, although publisher Sony Computer Entertainment has yet to relinquish release windows for either region. Let us know what you think of the bundle in the comments below!